Kids and teens worldwide are currently using social media and ICTs to become heroes and solve real world problems. 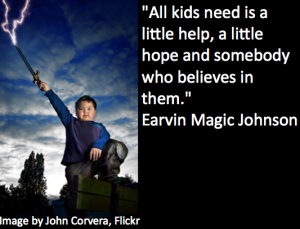 You can read about a few in this post, 10+ Kids Transforming the World Through Social Media. At the Bammy’s, I was privileged to meet one extraordinary 13 year-0ld, Mallory Fundora, who founded Projectyesu.org, an organization that provides food, medicine and education to women and children in Uganda. She raises awareness and gains support through social networks and web tools like Twitter, Facebook, a blog, and Youtube. We have the opportunity to implement problem based learning and teach our learners how to use web tools and social media to solve real world problems. It’s learning that shows results in a meaningful way. The Prezi below shows the general parts of a problem based learning project that integrates ICT! Just click within the presentation to visit that resource or example. These are 4 basic parts of a PBL lesson with ICTs. I have highlighted these steps using Valerie Burton’s lesson, Teen Advocates Fight Against the Drop-Out Rate. Make it a powerful story that engages them or strikes an emotional chord. Ways to introduce the problem- through a blog post, show a video, take them through a case study, analyze an infographic, or have them play an online game or simulation. Valerie introduces the problem on her blog. In addition, students play a game at Boosthigh.org to learn about the drop-out rate. At this point, give students their mission with guidelines. Valerie’s mission is, “Create a website that hosts videos, blog posts, comics, PSAs, etc. to help decrease the dropout rate at our high school.” Keep it short and simple so students understand the task. You can include the solution product or leave that open and allow them to decide how to solve the problem. Most teachers will have a solution in mind, such as develop a safety poster or create a PSA. Give students time to reflect on the problem in pairs or groups. Find a variety of brainstorming tools here, http://pear.ly/bKmy9. You can give them the solution and guidelines when you introduce the problem. Examples may include, create a digital campaign or poster, make a Public Service Announcement (PSA), create an online game, create an ebook, organize an online project, create an advertisement, make a video, develop a product, design an app, host an event, create an infographic, or create a social network! Alternatively, you can give them a list of solutions to choose from like Valerie did. This presentation was 1 of 6 sessions I gave at the #GAETC13 conference, which was held in beautiful Atlanta, Georgia. The resources for all 6 sessions are here, http://teacherrebootcamp.com/tag/gaetc13. I tried collaborative note-taking with the audience on one Google Doc. Access those notes here, http://bit.ly/pbl123. Thank you to Javaye Stubbs, Aaryn Schmihl @aschmuhl, Penny Christensen, @pen63, Kristen Drake, Margaret @MGGunter, Amy Sutton, @daniellesherfey, Marisa Wesker @WeskerTeach, Jessica Burce @jessica_burce, Tracy Sayer, Robin, @jandrwalters, Danielle @daniellesherfey, Alicia Coffie, Ambe Olinga @AJOlinga, Andy Pike @ANDYPIKE4, Michelle Easley @measleyfcs, @roamy82, Mike Vigilant @mikevigilant and others who helped with the collaborative note-taking experience. Use one of these resources or ideas and share with me how the experience went with your learners.